Time for me to write 2013 on my rent check until roughly August. I’m fairly certain that you guys know me well enough by now that you know how I spent my New Year’s Eve: with a pork product. And I DID. In reality, I spent the evening with my friends Alison, Cagney, and Jennie. We had a relaxed New Year’s Eve, on account of desired laziness and Alison and Cagney’s baby being under the weather. We made dinner, Cagney obsessively watched Miley Cyrus Takeover on Fuse, we got super drunk*, and I was home by 12:20. *We did not get super drunk even a little bit. No hangover on New Year’s Day? Great start to 2014. As for the dinner making, our motto was New Year’s Easy. COPYRIGHT ME 2013. **We did not get super drunk at all, we flipped the channels between Jackass the movie, the aforementioned Miley Cyrus takeover, and the New Year’s Eve shows making fun of the people who stood in front of Times Square. 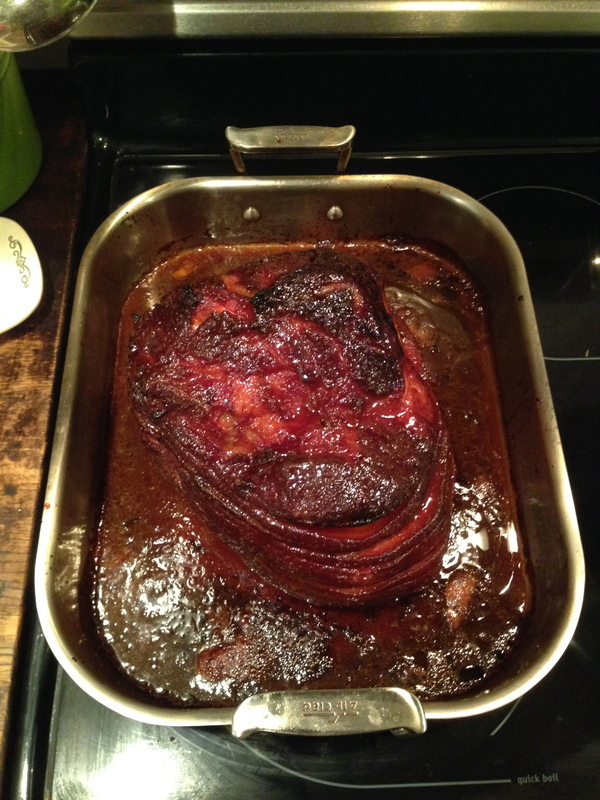 The ham is unbelievably simple, but has amazing flavor. Sticky sweet and deeply smoky because of the bourbon. ***We did not get monumentally drunk. I fell asleep for a minute on the couch at like 11:30 because I get sleepy. 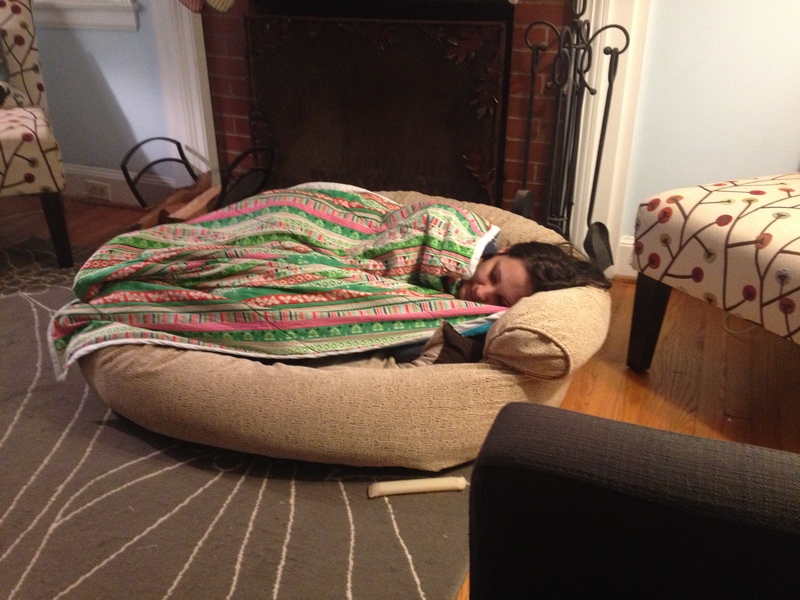 And this is a picture of Alison PROBABLY asleep in her dog’s bed. Make this ham. You don’t be disappointed. You’ll have plenty of leftovers. And even if you don’t get drunk, at least your ham did. In the original recipe, the ham is studded with whole cloves; however, speed up the recipe by adding the whole cloves into the bourbon sauce. The clove flavor will still infuse in the ham, plus upon service, your guests won’t have to pick out the buds as they eat the ham. Preheat oven to 325°F. Remove skin from ham and trim fat to 1/4-inch thickness. If ham is not precut, make shallow cuts in fat 1 inch apart in a diamond pattern. Place ham in a 13- x 9-inch pan. In a medium bowl, stir together all other ingredients. Spoon entire mixture over ham. Bake at 325°F on lowest oven rack for 2 hours and 30 minutes, or until ham has an internal temperature of 145°F. Baste with pan juices every 30 minutes as ham cooks. Remove ham from oven and rest it for 15-30 minutes before carving. Strain sauce and serve it in a gravy dish alongside the ham (optional).